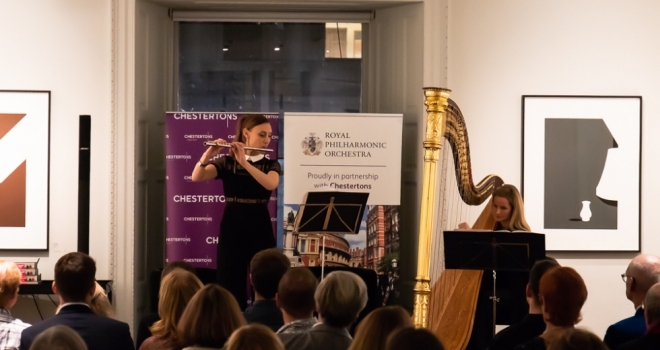 London based estate agents, Chestertons, is pleased to announce its most recent art collaboration with the Royal Philharmonic Orchestra as an extension of its successful partnership with the Royal Academy of Arts. The new partnership officially launched at the Royal Academy of Arts during Chestertons Autumn Art programme in October where RPO’s MD Huw Davies and two artists from the orchestra explained what it was like to be part of the world-famous ensemble and performed for around 50 guests. As part of the relationship, Chestertons has been offering customers tickets to a number of select RPO concerts and there are four more coming up. From Darkness to Light, considered as one of the greatest violin concertos, featuring the talented Esther Yoo will take place at the Cadogan Hall on Tuesday 13th November. The orchestra is then going to be conducting an exciting brand-new festive concert, Winter Wonderland, packed full of well-known orchestral works and themes from seasonal operas and ballets on Friday 7th December. Next year, tickets will be available for Love, Legends and Fairy Tales on Tuesday 5th February and Symphonic Masters on Thursday 28th March at the Royal Festival Hall.